Andrew Brunson, shown here in July, was one of thousands arrested in Turkey after a failed coup attempt in 2016. Turkey has ordered the release of U.S. pastor Andrew Brunson, who has been in detention since 2016 in a case that has raised tensions between Turkey and the U.S.
A court in the western city of Izmir actually sentenced Brunson to a little more than three years in prison, according to Turkey's state news agency Anadolu. However, as NPR's Peter Kenyon in Istanbul explains, the court says he will serve no more time, considering his health issues. "The court also lifted judicial controls on Brunson — that means restrictions on his movements have been lifted and he is now free to leave the country," Kenyon reports. The prosecutor had asked for a 10-year sentence. The evangelical pastor wept in court upon hearing the news of his release, Reuters reported. Prior to the ruling, he said, "I am an innocent man. I love Jesus, I love Turkey." After he listened to an alleged witness, he said, "I do not understand how this is related to me." Brunson, who is from North Carolina and has lived and worked in Turkey for more than two decades, was arrested following a failed coup in 2016. According to Anadolu, he was charged with being a member of the Fetullah Terrorist Organization, the group that Turkish President Recep Tayyip Erdogan blames for the attempted coup. The news agency says Brunson also was charged with spying for Kurdish militants. Turkey has been criticized for the sweeping arrests after the coup attempt, where tens of thousands of people were taken into custody over their supposed links to terrorist groups. The country's leadership has said the mass arrests are necessary for security. Earlier this year, it had looked as though Brunson might have been released. "The White House thought they had a deal after President Trump spoke with Turkey's president. But at that point he was only moved from prison to house arrest, and that upset the White House," Kenyon reports. "Pressure's been ratcheting up ever since, there's been sanctions back and forth, and there's no doubt that with the shaky economy here Turkey really wanted to put this dispute behind them." In August, the U.S. imposed sanctions on two Turkish cabinet ministers in direct retaliation over Turkey's continued detention of Brunson, as NPR's Colin Dwyer reported. News of proposed sanctions was greeted warmly by top evangelical Christians, reports NPR's Sarah McCammon. They "form a key part of Trump's base and have long advocated for increased protections on religious freedom in the U.S. and abroad." Erdogan had previously attempted to craft a deal with the U.S. to trade Brunson for Fethullah Gulen, the U.S.-based Turkish cleric whom he blames for the coup attempt. Gulen has denied those allegations. Kenyon says Brunson's release probably will go over well in Turkey, where the punitive sanctions appear likely to be eased or lifted. "President Trump and his team have been tenacious in seeking the release of Pastor Brunson," Jay Sekulow, a lawyer for Brunson, said in a statement. 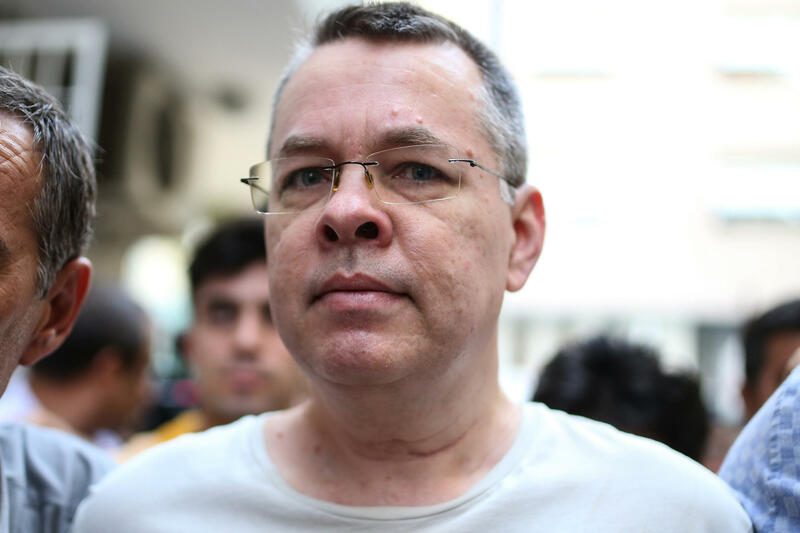 "We're grateful to the President, members of Congress and diplomatic leaders who continued to put pressure on Turkey to secure the freedom of Pastor Brunson. The fact that he is preparing to return to the United States can only be viewed as a significant victory for Pastor Brunson and his family." Trump has been following the news closely this morning, with multiple tweets about Brunson. Upon news of the court decision, he wrote, "PASTOR BRUNSON JUST RELEASED. WILL BE HOME SOON!"